Referees at the World Cup this year will wear watches that will vibrate and display the word “GOAL” each time a ball crosses the goal line. FIFA had been discussing the idea of goal-line technology since the months following the 2010 World Cup. During that tournament England denied a score in a match against Germany even though the ball had clearly passed the goal line. 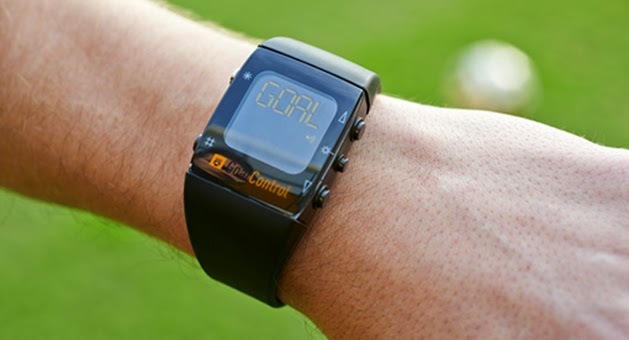 The buzzing watches serve only as a recommendation the referee still makes the final call on a goal. The smartwatches used in Brazil are made by a German company called GoalControl, which installs 14 cameras that track the ball around the pitch. It was first used in the FIFA Confederations Cup last year, a tournament that passed without goal-line controversy. GoalControl is the specialist for real-time image analysis in sport events. Their team has many years of experience in developing and deploying camera-based vision systems that can detect, identify and track moving objects in complex sceneries. With GoalControl-4D they present a system that meets all FIFA criteria for goal line technology and that can assist the referees substantially with the decision "goal or no-goal". By means of 14 cameras mounted on the stadium roof/catwalk, the system captures the three dimensional position of the ball with very high precision in the air and on the pitch. When the ball passes the goal line, all referees receive in less than 1 second a vibration- and optical signal at their watches. The GoalControl-4D system works with 14 high-speed cameras (7 per goal) around the pitch at the stadium roof/catwalk. The cameras are connected to a powerful image processing computer system which tracks the movement of all objects on the pitch and filters out the players, referees and all disturbing objects. The remaining object is the ball and the system knows its three dimensional x-, y- and z-position with a precision of a few millimeters in the coordinate system of the pitch. When the ball passes the goal line, the system sends a vibration- and optical signal to the officials´ watches. Of course, all camera images of such goal event, and also of all near-goal events, are stored and can be replayed anytime. Do you like the idea of having the referees where a special watch for futbol? Do you prefer the game to be called futbol or soccer? As a reminder, in soccer, the ball must fully cross the goal line to be a goal. Thank you for taking the time to read our smart watch blog post. We hope that you stylish futbol fans have found this news to be informative. If you have comments or questions, please add your thoughts in the discussion area below.